SHAKESPEARE, William. Taming of the Shrew. 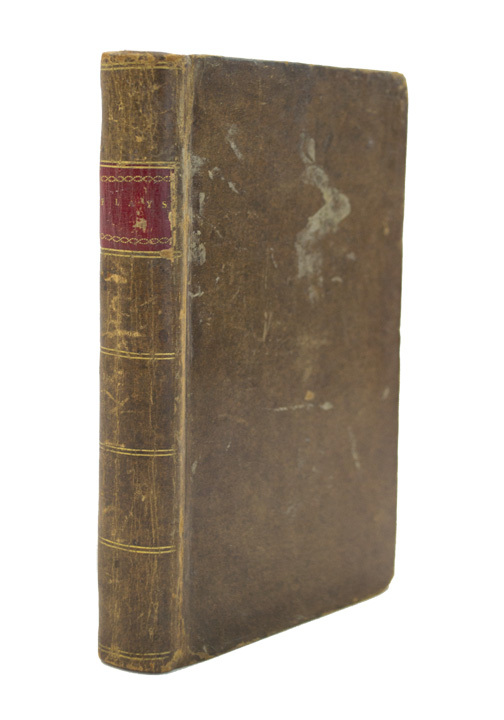 London: Printed for C. Bathurst... , 1786. MOORE, Edward. The Gamester, A Tragedy of Five Acts. Marked with the Variations in the Manager's Book, at the Theatre-Royal in Drury-Lane. London: Printed for S. Bladon...,1789. SOUTHERN, Thomas. HOPKINS, Mr. Isabella; or the Fatal Marriage. A Tragedy, Altered by Southern. 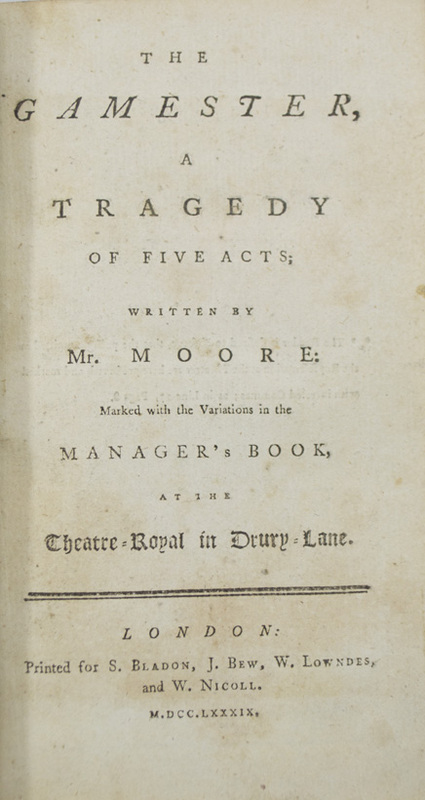 Distinguishing Also the Variations of the Theatre, As Performed at the Drury-Lane. Regulated from the Prompt-Book, by Permission of the Managers. London: Printed for John Bell, 1780. MURPHY, Arthur. The Grecian Daughter. A Tragedy. 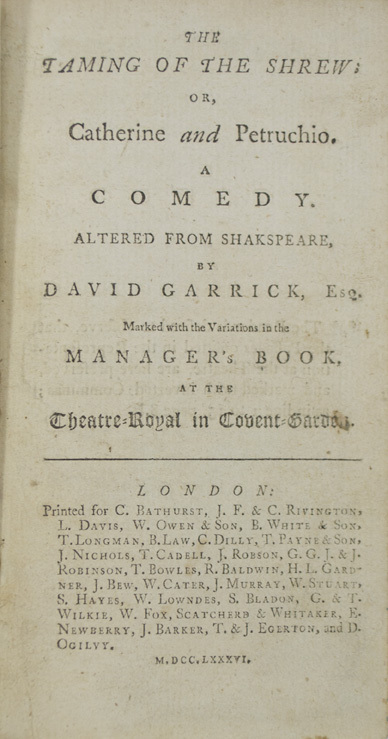 Marked with the Variations in the Manager's Book, at the Theatre-Royal in Drury-Lane. London: Printed for T. Lowndes..., 1777. ROWE, Nicholas. The Fair Penitent, A Tragedy; Of Five Acts. Marked with the Variations in the Manager's Book, at the Theatre-Royal in Drury-Lane. London: Printed for T. Lowndes..., 1790. ROWE, Nicholas. Jane Shore. A Tragedy of Five Acts. Marked with the Variations in the Manager's Book, at the Theatre-Royal in Drury-Lane. London: Printed for T. Lowndes..., 1791. Six plays bound together. Octavo (6 3/4 x 4 inches; 172 x 100 mm). 34, [2, ads]; 70, [2, ads]; 53, [1, blank]; 64, , [5, ads], [1, blank]; 55, [1, ads]; 51,  pp. Full speckled calf. Spine with red calf spine label, lettered in gilt. Spine ruled in gilt. Board edges tooled in blind. Edges speckled blue. Previous owner's bookplate on front pastedown. Occasional minor paper flaw and toning. Page 45 of The Fair Penitent torn along the bottom and fore-edge margin trimmed close, slightly affecting text. Page 19 of Jane Shore with a corner torn, just barely affecting page number. Overall a very good copy in nice condition.